Can you match the following three statements with the answers just below? Coal seam gas is bad for the environment and we should all protest against its use. Genetically modified foods are a part of multinational plans to take over the world’s food supply. Wind farms are dangerous to human health and should be restricted. a) Yes, everyone knows it is bad news. b) Well, I used to think that, but now I wonder if I was being manipulated by interest groups playing upon my emotions. c) I’m not really sure about that. I think there is more misinformation than information around. I’m guessing if you passed these questions around at your family dinner table, you’d match different statements with different answers. This is largely because we tend to look for answers that suit our views – and often form our views based on what our “tribe” thinks. But imagine a new technology came along – let’s call it Technology X – that could provide a source of energy for Australia, but which comes with social and environmental impacts. How would you form your opinion on it? You might consider doing your own research, but be quickly overwhelmed by the amount of information for and against, and not know quite what to believe. At that point you might look for the opinion of somebody you trusted, or make a decision based on your intuition. In this article I encourage you to form your own opinion based on your own and independent assessment of the facts. Our intuition is a useful thing that has served us well for tens of thousands of years, keeping us from wandering out of our warm caves into the dark and dangers of the night – but it is something that has become less suited to the modern high-technology world. We like to think we are rational beings. But when faced with uncertainty, we still have a tendency to make decisions based on emotions, before looking for information to support our decision; even sticking with that decision when data proves it is wrong. What if we were able to put that aside and make decisions on contentious issues, such as coal seam gas, based on our own individual assessment of the data? What is conventional versus non-conventional gas?. The Grattan Institute, Getting Gas Right, June 2013. As with any issue, there are interest groups on all sides that would have you believe that they are the only people providing a true interpretation of the data. There are clear benefits and there are clear risks. There are many overstated benefits and there are many over-stated risks. There are impacts on the economy, environment and communities, and it is not really possible to talk about one without including the others. Despite all the things we know, there are still some unknowns. A healthy approach to any contentious issue is to treat all information as possibly coming from a self-interested point of view, until you can confirm it or not. There are some great resources for testing the claims of dubious alternative medicines, such as Quack Watch and of the claims of major pharmaceutical companies such as Bad Science. But where do you go to test the claims being made about unconventional gas? I’d start by saying look at the calibre of the data, rather than the source. What studies support the statements being made? Who conducted them? Where were they published? Has any independent source agreed with the claims, or disputed them? When figures are given, do they give all the information needed? As well as giving this scrutiny to statements you’re a bit uncertain of, it’s also useful to apply it to those that appeal to you. Deciding whether coal seam gas is good or bad is wholly dependent on the individual’s definition of the words “good” or “bad”. It is in the interests of the industry to make you believe that coal seam gas is good for Australia, while the opposite is true for other groups. The role of scientists, and organisations such as the CSIRO, is to act as an honest broker and try to bring some clarity to the debate. 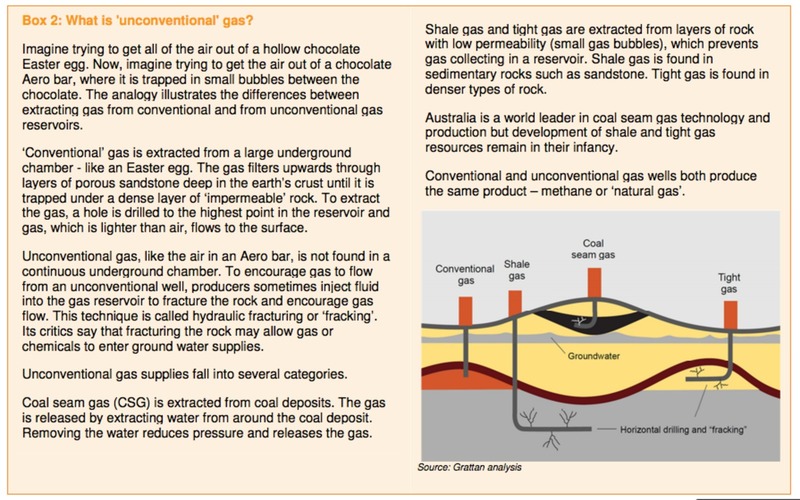 We know that coal seam gas can be used as a source of energy and that Australia has vast reserves. But we also know that its development can have environmental and socio-economic impacts on our rural communities. CSIRO’s aim is to inform the community, government and industry about the risks and opportunities that stem from developing Australia’s unconventional gas resources. It is a complex issue, and a divisive one. There are things we know, and there are things we don’t. So what would you like to know? Please leave your questions and comments below, and let’s start the discussion. Editor’s note: Alex Wonhas’s Q&A is now over – but please keep leaving your questions or comments about coal seam gas, fracking, or other issues related to unconventional gas below. Thanks for joining in the conversation. Alex Wonhas oversees a team that receives funding from the Gas Industry Social and Environmental Research Alliance (GISERA), which is a collaborative vehicle co-funded by CSIRO, Australia Pacific LNG Pty Ltd and QGC to undertake research that addresses the social and environmental impacts of Australia’s natural gas industry. The partners in GISERA have invested more than A$14 million over five years to research the environmental, social and economic impacts of the natural gas industry. GISERA projects are overseen by an independent and publicly transparent Research Advisory Committee and made publicly available after undergoing CSIRO’s peer-review process. Animation ink will be attending the APPEA conference in Brisbane on may the 17th. We will be proud to support the realese of over 20000 DVD’s of the “The journey of Coal Seam Gas to Liquefied Natural Gas”. Over the past couple of months, Animation Ink has been developing new custom pipeline to add to their production schedules. Advanced 3D terrain modelling and mapping has been developed to simulate real life project sites. Live Eco System can now be simulated with realistic Trees, clouds and Atmospheric effects. This is a huge step forward from previous production pipelines. Animation Ink has completed a cross-section 3D illustration depicting the coal seam gas drilling process. The illustration was highly technical showing the fracturing drilling process underground. Local communities and group interpret the data as a educational A0 diagram. Animation Ink has completed upgrading their state of the art in-house render farm. We look forward to increasing the quality of our final product and faster turnaround in render speeds. Animation Ink has also opened its doors to local company’s and artist to render out projects at the new facilities. A web based ftp client is under development which will link job submissions to the render farm. Drawing from experiences in the Coal Seam Gas and Mining Industry, Animation Ink created BMA 5 minutes visualisation presentation. It was successfully launched and screened at the recent 34th IGC Conference held in Brisbane, The production highlighted exciting BMA job roles in Geology and the benefits of working for BMA. A complex data pipeline was produced to display large geotechnical 3D data sets and terrain modelling on one of the largest mine sites in Australia. Other technical milestones were accomplished, i.e., the production of well cad data from over 16,000 wells and displayed actual core samples. Following on from the strong video release of the astounding growth of the APLNG project, Animation Ink updated the existing production to reflect changes within the project. Such as the Joint venture partnership between Origin, ConocoPhillips and Sinopec and the growing engineering structures and layouts. The 3D production is now used for both informational and capital raising purposes, it has now been reproduced in Mandarin for Chinese audiences. After a successful 3D campaign depicting the operation process of the new QER oil shale processing plant in Gladstone. Animation Ink was contracted to produce a 3D flyover of the site using Digital Terrain Models and Satellite Imagery. Using the latest in EcoSystem Population Program & the Queensland largest 3D render farm, Animation Ink populated the scene with over 1.2 million instance of trees, grass, and bushes to produce a look which was realistic and aligned with QER corporate guidelines. In recognition of our strong track record producing animations for the burgeoning coal seam gas industry, Animation Ink was contracted by Australia Pacific Liquefied Natural gas to develop a DVD production showcasing their landmark $35 coal seam gas project, a join venture between Origin Energy and Conoco Philips. The production outlined each of the project’s key phases and technical processes, drawing on a mixture of stills, film footage and custom process animations. Used for both informational and capital raising purposes, it has now been reproduced in Mandarin for Chinese audiences.